With five of the six known players having released their full frame mirrorless cameras into the wild—okay, Panasonic is still in the process of processing their goodies to let them into the wild by Spring—it's probably a good time to summarize where we are and what's happening. We clearly have a group of products sitting at today's full frame entry pixel count, 24mp. That's the Leica SL, whatever the Leica M model-of-the-day is (can I interest you in faux Cheetah skin? 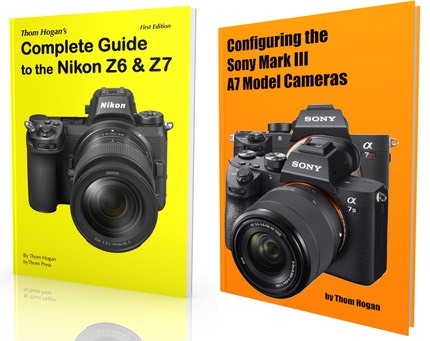 ), the Nikon Z6, the Panasonic S1, and the Sony A7m3. The 24mp entry price was US$2000. Clearly that will fall soon as Canon, Nikon, and Sony try to duke things out for market share. Panasonic is up above that pricing with their S1, and I have to question whether there's enough in that camera to justify the higher price. Pixel shift and the EVF are what I keep coming back to. But I don't yet know how well the pixel shift actually works in practice, and while the EVF is beautiful for a still scene, the use of DFD focus gives it a bit of "wobble" when you're focusing, so you go from not noticing the EVF aspect to very much noticing it. At the top we have the Nikon Z7, the Panasonic S1R, and the Sony A7Rm3. While the practical impact isn't particular problematic, it's interesting how Sony only went from 36mp to 42mp with a mild pixel shift, while Nikon and Panasonic aimed higher. I'd bet the A7Rm4 is going to return serve and add significant pixels again. I'm going to make a strong argument here: if you're interested in this level of mirrorless full frame, you shouldn't be making a decision between these three cameras without fully figuring out your lens set. Don't put cheap lenses on expensive, highly capable sensors. Well, you can if you want, but then I'm not sure why you're buying the highest end pixel count in the first place. That's the really interesting thing here: Nikon, Panasonic, and Sony have all essentially put out the same body with the same features in two forms: Regular and Super Size (pixel count). I really don't see the point of buying Super Size unless you're going to have the lenses that make the Super Size shine. Nikon's at a slight disadvantage here, with only four S lenses at the moment (though they're all remarkably good lenses; better than the low end Sony choices they match up with). Panasonic is going to get a L-mount turbo boost (wait for it, wait for it...), while Sony has built out a very nice set and has reasonable third-party support. Caution, though, not all the FE lenses are good at 42mp, and I'm betting Sony won't stay with the lowest count long. An interesting thing, that. Would you believe the R is their short-term, high-end camera to compete with the Megapixel Galore crowd? At 30mp, that seems problematic, doesn't it? The problem I have with that is that Canon seems to be coming in too low with cameras, too high with lenses (really, a big, heavy, expensive 28-70mm f/2 zoom on a US$1600 entry camera?). Moreover, the savvy customer is already seeing the missing elements in Canon's product (e.g. no sensor stabilization in the EOS R). This is the tricky part for Canon. They can push price down and try for greater sales by reusing sensors (exactly what they've been doing across the board lately with the dual-pixel sensors). Those sensors already come with some small disadvantages against the Sony-derived ones used by Nikon, Panasonic, and Sony. But when you add in the other disadvantages (no IBIS, no advanced features like pixel shift or focus stacking, crop-only 4K, etc. ), it looks a lot like you're buying a stripper Kia instead of a Lexus. Canon's initial play seems to be to just get customers, then catch up with technology. I predict that in the 24mp game, Nikon and Sony will push their pricing down to keep Canon from gaining any traction. They don't have to match Canon, actually, as I expect Nikon and Sony can point to significant differences in their products that justify an extra US$100 or US$200. Still, I don't think the US$2000 entry price is going to hold. Sony could tell us a lot more about that, as they've had the A7, A7m2, and A7m3 on sale together at different price points and accumulating lots of sales data. Sony knows more about where the optimum price/sales point is than any of the others. They'll drive right to it, I would guess, then continue to use their older models to undercut Canon. The upper cameras with more megapixels right now add about US$1000-1300 to the entry model. But if Canon enters lower and Sony lowers their price as I expect (forcing Nikon to do so, too), I don't think we'll see the Megapixels Galore models holding their current price levels, either. By the time Panasonic actually ships their S1/S1R in April, they're going to find they've been moved a little higher in perceived pricing than they originally thought they were. 2019 is therefore going to be the year of an all-out mirrorless full frame war. Full frame is where the profit margins are. It's where the lens-accumulating customers are. We've now got four new mounts that want to establish themselves for the future, and all the true R&D energy is focused there. The war is going to be played with pricing and marketing (which favors Canon and Sony). Given what I now know about how the full frame game is going to be played this year, I'm going to have to adjust my thoughts on how the entire ILC market plays out. You should, too.